When I was young, we lived on the outskirts of Tucson, Arizona, surrounded by the beautiful Sonora desert. 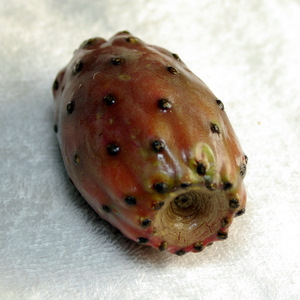 We kids would pick the fruit of the prickly pear cactus, braving the tiny spines that lodged in our fingers to peel and eat the fruit. My mother would make prickly pear jelly, although one year in our eagerness, we kept fussing with the jars, which never set, and we had pancakes with prickly pear syrup instead. When I recently saw prickly pear fruit in the grocery store here in the Seattle area, I couldn’t resist. I knew there was no way that these supermarket specimens could be as ripe and delicious as the fruit I picked off the cactus in the backyard. The first thing I did with the fruit was peel off the tough outer skin and last few straggling spines. The inside fruit was a beautiful deep red. The outermost layer was a bit soft, but the middle was firm and even a bit crisp. The flavor of the fruit is a bit like a rich, spicy concentrated watermelon. Being a desert fruit, the natural liquor to start with was tequila. I chose to muddle the fruit with a little agave syrup. Then I added some lime juice and orange liqueur to balance the flavors. Muddle prickly pear fruit in agave syrup in shaking tin. Add rest of ingredients and ice. Shake until good and cold. Double strain into cocktail glass. 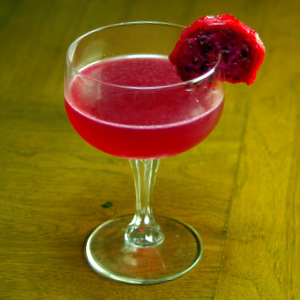 Garnish with slice of prickly pear fruit. To be honest, the result is a flavored margarita. But the prickly pear brings an unexpected, new flavor that I really enjoyed. I gave Bryan a taste, and his immediate was response was this drink is something he’d be happy to order in a bar. I did have to pick out a couple of stickers from my fingers in the process, but it was definitely worth the effort. A little taste of my childhood in a great tasting drink. What’s not to love? It’s still safer than running full tilt into a cholla cactus. Don’t do that. Trust me. What a beautiful colored cocktail! i really like tequila and i like the prickly pear cactus too but i dont like its little stickers..i haven`t yet managed to handle these without getting any stickers on my fingers despite how careful i may be. I’ve never tried prickly pear before, but it’s an emerging new flavor in cocktails. One report I saw recently showed its use in cocktails at bars & restaurants grew 14% in 2008. Can’t wait to give it a go! I recently bought this along with some paers and served them sliced with Stilton blue cheese. They were the hit of the dinner party. I love these and will try them in a cocktail now. I saw these fruits grew wildly and abundantly while driving down on farmer roads in Texas, but thought they were inedible! After reading your post, I definitely have to embrace this new fruit!